I hope you've had a great Sunday. 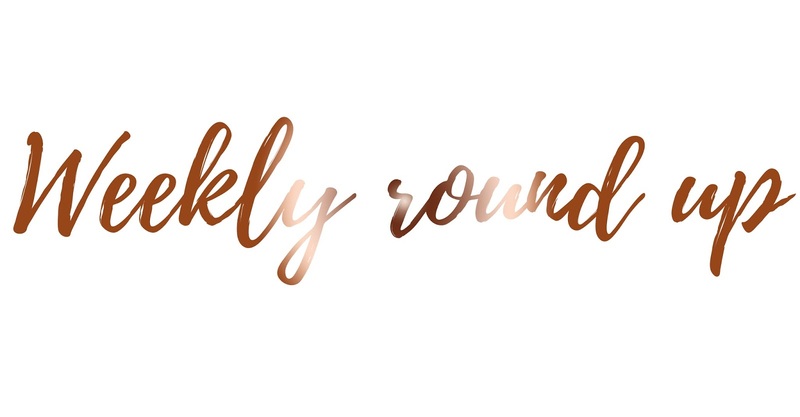 I'm back again with another Weekly Round Up and honestly, I don't really have much to tell you apart from the fact I'm absolutely knackered and I need to sleep for a million years to catch up on how exhausted and tired I feel. If you've ever gone on a training course then you'll know exactly what I mean. I am drained. Once again it has been another busy week where I've slept, gone to work, slept again and then gone on a training course for a whole weekend; absolutely brilliant! Waking up at 6am on a Saturday and Sunday is exactly what I've always wanted, but by doing this I am now Paediatric first aid trained; woooo! I have been wanting to be first aid trained for a couple of years now and after what feels like the longest weekend ever, I am finally trained in saving lives. I have to say this week I have neglected my blog a little bit, I've simply scheduled posts, scheduled tweets and pretty much ignored social media for the whole week and my emails because I've been so tired. Let's hope this coming week isn't the same! Although I missed yesterday's post due to tiredness and pretty much sleeping as soon as I got home from work on Friday, this morning I published my post on looking back on my second year at University, so make sure to check that out once you're done here! I'm now going to be posting every single Saturday with a student/university theme post as we go into the Summer holidays and when I personally start taking my dissertation seriously. If you have any suggestions or any student themed post you'd like me to write about here on my blog then please leave a comment with your suggestion; they always help! This week I have realised that social media is currently hitting rock bottom when it comes to gaining followers. Usually on Twitter I'd gain between 500-1,000 followers in a month, but in 15 days it's been a struggle to gain over 100. What is going on? And don't even get me started on Instagram and people who follow and unfollow; I'm getting really sick of these people and I'm sure you are too! Why is social media trying to screw our hobby up by ruining engagement? I'd love to have a valid answer for this because it's really not helping. If you're still interested in the threads I put up fairly regularly on Twitter to gain followers and engagement on your social media accounts then also let me know and I will continue to do these. Also if you catch someone following you then unfollowing, please let me know so we can make these individuals aware that we know what they are up too. Have a lovely Sunday guys and let me know what you have been up to this weekend.